After almost 60 years as an entertainer, Ronnie Corbett remains one of the most instantly recognisable faces on British television. Martin McGrath talks to him about life in the union, comedy and his only disagreemnet with Ronnie Barker. Meeting Ronnie Corbett is a strange experience. He has been one of the most instantly recognisable faces on television for decades and you immediately get the sense that this is someone you’ve known and liked for a long time. At the peak of The Two Ronnies popularity 22 million people were tuning in each week for the mix of sketches, variety-style entertainment and clever word play. That show lasted an incredible 16 years and together Ronnie Corbett and Ronnie Barker made 98 episodes. But like all good showmen, they quit on their own terms in 1987 leaving audiences still wanting more. I think it is fair to say that for many years Ronnie Corbett was more famous than most rock stars. However, even though we meet for the interview in the salubrious surroundings of the Hilton Park Lane Hotel, where Ronnie is getting ready for a corporate gig as after-dinner speaker and awards host, there is nothing in the way he acts that suggests that the fame might have changed him. Indeed, chatting to him about his career, and almost 60 years as a member of Equity, he seems exactly like the character we are familiar with from years on the television. He is relaxed and funny and his answers to my questions are long, occasionally rambling, encompass an enormous cast of characters and are suffused with self-deprecating wit. He’s quick to pay tribute to the help he has received throughout his career and the contribution of the performers, producers and writers he’s worked with. His answers to my questions are most often diverted along routes that lead to praise for other people. For example, when I show him a copy of his original Equity application form, and ask him what he remembers about joining the union, he immediately begins to discuss the people who helped him into his first role. He was proposed and seconded for his membership of Equity by the stars of You’re Only Young Twice, Diane Hart and Charles Hawtrey, but Corbett’s future didn’t lie in movies. Over the next decade Ronnie would make a smattering of television appearances but it was in clubs, reviews and seaside concert parties that he worked most often and started to make a name for himself. As well as providing much needed work, Ronnie looks back on those concert shows and his work on stage as laying important foundations for his future success because the work encouraged versatility. From seaside concert shows Ronnie began to find work in London’s burgeoning club scene – though not all of it was onstage. Between jobs he worked behind the bar at the Buxton Club, a famous hang-out for theatrical types in the late fifties and early sixties. It was there that he was introduced to Digby Wolfe – a comic, actor and writer – who used Ronnie in his television programme and then asked him to work in a show he was putting on in the hot Mayfair nightclub Winstons, then owned by Danny La Rue. The move to Winstons was an important one. Amongst the performers also on the bill in the nightclub was Ann Hart, who Ronnie would marry in 1965. “She was singing and being very funny,” Ronnie remembers. They’re still together almost 45 years later. I asked Ronnie whether it helped having a partner who understood the business. As well as meeting his future wife on stage at Winstons, Ronnie was also spotted by David Frost, who invited him to work on The Frost Report. On that show he worked with Ronnie Barker for the first time and under the auspices of Frost’s company Paradigm he’d go on to feature in television shows such as No – That’s Me Over Here, Now Look Here, The Prince of Denmark and hosting his own variety show, The Corbett Follies. So he was already a successful and increasingly recognisable face on television when an appearance presenting an award with Ronnie Barker at the BAFTAs changed his career. In many ways The Two Ronnies was an unusual show, not least because the two stars never really formed a traditional double-act. There was no straightman/comedian split, they’d often perform sketches and routines apart and even when they were on screen together it was very much a partnership of equals. When Ronnie Barker died in October 2005, Ronnie Corbett told the press that in all the years they’d worked together there’d never been a cross word between the two men. For those familiar with the sometimes competitive and occasionally spiky world of comedy it was a remarkable statement. Even more so given that this was a relationship without a defined funny man/straight man division. Surely, I suggest, there must have been times when there was competition for the best lines? “There was never competition between us,” Ronnie says flatly. There must have been something? So the truth is the only time Ronnie Corbett and Ronnie Barker argued about their work was when they had to bend the rules to accommodate the outside world. I asked Ronnie about the monologues he delivered from his famous chair, and I suggested that these sections were a very modern style of comedy – not the rapid fire gag! gag! gag! pattern familiar from other comedians of that era but more like the rambling storytelling that many modern comedians employ. Again he’s quick to pass the credit for the success to the others – specifically to the writers Spike Mullins and David Renwick, who crafted the material for him over the years and for whom Ronnie’s praise is effusive. When I try to insist that the format, which he’d already used while introducing The Corbett Follies, was ahead of its time and might explain why decades after the end of The Two Ronnies he remains beloved of a new generation of comics, he prefers, again to talk about those behind the scenes. But the fact is that the wheel has turned. After what might have been an initial down period – the end of The Two Ronnies coincided with the end of his most successful sitcom – Sorry – Ronnie Corbett is now perhaps more respected than at any stage in his career. There’s no denying that there’s nothing like The Two Ronnies on television today but, I insist, it was about more than just the money. Surely the two performers at the heart of it all brought something special. The difference, Ronnie suggests, might lie in their background – both Ronnies had experience as character actors and in a wide variety of performance styles. I ask him whether there’s anything that he wishes he’d done in his career and he seems at a loss for the first time in the interview. It’s clearly not something he’s given a great deal of thought to. What about films, I prompt? He did of course recently take a little step out of his onscreen persona when he appeared in Ricky Gervais’s Extras and is famously “captured” taking drugs during a BAFTA award ceremony. The memory of that makes him laugh. So perhaps there’s another turn in his career still to come if there are any directors brave enough to cast him against type? But he’s not unhappy with his present lot. As we prepare to leave I ask him what he’s most proud of having achieved in his career. So he doesn’t envy the modern comedians with their stadium tours and their huge crowds? But while the comedy scene might have changed out of all recognition in the almost 60 years since Ronnie Corbett got his first Equity card on the set at Southall Studios, one thing has remained constant, his membership of the union. Does he have any advice for new comedians? Again he hesitates. He doesn’t want to be seen as talking down to anyone. Throughout our interview Ronnie Corbett proves that, like his heroes, he’s still thinking about the rest of the production not just about himself. His modesty is striking, his determination to share the credit for his success is admirable and his memory of those he’s worked with is razor sharp. Some people, having achieved far less, have become far more convinced of their own importance and demand recognition from all around them. It says something for Ronnie Corbett’s self-confidence and strength of character that there isn’t a whiff of egotism about him. And yet, despite his best attempts to avoid taking any of the credit for his own success, his talents are obvious throughout our meeting – and have not dimmed over the years. He still has that easy wit, the casual charm and, above all else, he is a fantastic raconteur. 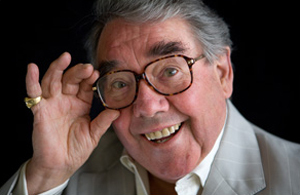 Ronnie Corbett is a natural-born storyteller and that can’t help but shine through.